Let's shake up a Monotonous Monday with a giveaway and rave review, shall we?! I recently discovered a new skincare line, and I've been so happy with my results that I want to share my experience, as well as the product being reviewed with one lucky reader! Most of you know that I'm a total skincare junkie, especially the anti-aging kind. So, I was really excited when I got the opportunity to try a new line of anti-aging skincare by the brand Mellisa B. Naturally. With a passion for health and skincare and decades of working and training in the skin care industry, Mellisa Baylis and her husband Ray, set out to create the best skincare on the market. Combining modern science with the most natural ingredients, their products are both safe and effective. In this post, I'll be reviewing and giving away their Premium Moisturizing Cream. I have combo/oily, dehydrated, reactive, and acne prone skin. yay, me! Their products only contain ingredients that are pure, healthy, safe, and effective. You can read more about their ingredients HERE. "In 2016, Mellisa B Naturally introduced their line of anti-aging products that balance the potency of nature with modern cosmeceutical ingredients. Fruit and plant extracts work alongside peptides and antioxidants to create deep nurturing natural skin care." According to Mellisa B. Naturally's website "Each formulation has been independently evaluated by a third-party lab to affirm its potency, purity, and efficacy." They also work with skincare professionals on all of their formulas. Each ingredient is researched and deeply scrutinized before they decide to add it to a product's formulation. The Premium Moisturizing Cream is very lightweight but very hydrating and a little goes a long way. I like that it's not too heavy so it doesn't "weigh down" my skin and add to the sagging that aging skin can have. I didn't notice results immediately. but after about a week there was a noticeable difference in the clarity of my skin, it almost had a glass-like appearance. It's now been almost 3 weeks since I started the cream and my skin is much brighter and clearer. Fine lines and wrinkles are barely there. I looked in the mirror and thought, is this what a mild dose of Botox looks like!? I believe this botox-like effect is due to the ingredient "Argireline" that's in this product. My skin feels firmer and I haven't experienced any irritation or breakouts from this product. I test out a lot of skincare and I take pretty good care of my skin but your skin likes what it likes. And, as you can see by my before and after picture, this skin cream really agrees with my skin! Above are my before and after pictures after using Mellisa B. Naturally Premium Moisturizing Cream for approximately 2 weeks. I am totally makeup free in both photos and there are no filters used in the photos. This shows just what I see in person, much clearer and brighter skin. If you look at the lines around my nose and mouth they look really plumped up in the after picture. The spots on my face have faded as well. I've found that I can wear less makeup since my skin is looking so much clearer! I couldn't be more impressed. These results didn't come overnight but these results are pretty amazing for 2 weeks if you ask me! I can't wait to see what happens after continued use. 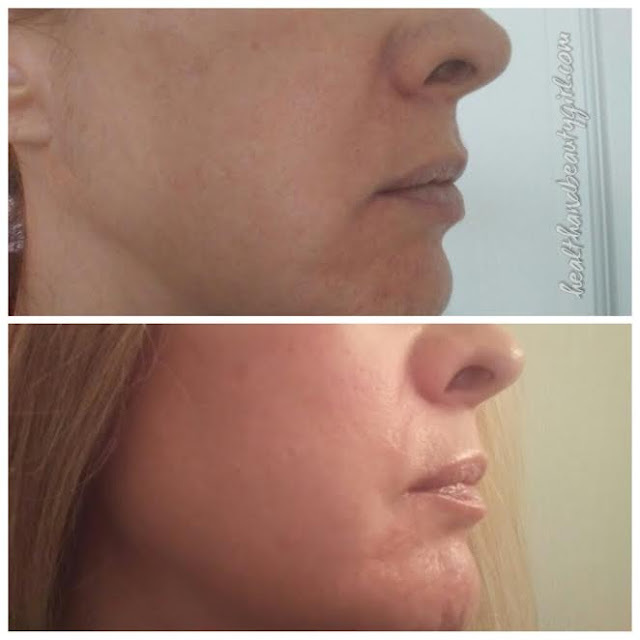 After showing my before picture to Mellisa, the owner of Mellisa B Naturally, she explained that my skin looks inflamed in the before picture and in the after it is much less inflamed. This reduction in inflammation is most likely due to the Peptide called Progeline that they use in this formula. Progeline slows down enzyme production which can cause inflammation in the skin. Just one look at the ingredients in this product and I'm really impressed. I recognize most of them and I don't see any cheap fillers thrown in. Water, Helianthus Annuus (Sunflower) Seed Oil, Glycerin, Argania Spinosa Kernel (Argan) Oil, Emulsifying Wax, Cetearyl Olivate, Sorbitan Olivate, Rosa Canina Fruit Oil, Palmitoyl Tripeptide-5 (Syn-Coll), Acetyl Hexapeptide-8 (Argireline), Trifluoroacetyl Tripeptide-2 (Progeline), Sodium Hyaluronate, Aloe Barbadensis Leaf Powder-Organic, Vegetable Collagen, Allantoin, Malachite Extract, Dimethylaminoethanol, Dextran, Carbomer, Phenoxyethanol, Ethylhexylglycerin, Potassium Sorbate, Leuconostoc/Radish Root Ferment Filtrate. After dealing with this company and using their products, I can tell that they pour their heart, soul, and years of experience into their formulas. Each ingredient is in there for a reason! I'm so happy that my skin LOVES this product! I'm really excited about this new line of skincare after seeing the results that I got from just 2 weeks of using this cream. I can't wait to try more products from this brand and share my results with you. Mellisa B. Naturally has a great range of products and caters to every skin type. One lucky winner will receive 48 grams of the Premium Moisturizing Cream (in the form of 2-gram sample packs x 24). This is more than the 30-gram full-size jar that I have been using. The sample packs will be great if you are doing any travelling. Open to the USA & Canada! *This product was provided for consideration. All opinions are mine alone. No affiliate links are used. I want to try this product as it is natural and free of chemicals. My skin seems to respond better to natural products. Me too! Good luck, Amy! Thanks for entering! Good luck, Lori!! I only put natural free from Parabens on my skin! I am always on the lookout to try New Products on my face. Thank you for the opportunity! Thanks for entering, Lynn. Good luck! Id like to win this cream as it would be amazing for my dry skin. I love your review, your skin loooks wonderful after using this product. Thanks, I see such an improvement from this product. Good luck!! I'm turning 50 in January and so finding good product is really the agenda for me.Thanks for the chance to try this one. Thanks for entering, Rhonda! Good luck!! I always love trying new skin care - I love that it is a natural product and is safe to use! Thanks for entering. Good luck, Joy! I've not heard of this brand, I'll have to keep an eye out for them. They are new to me too. Really high quality products I'll tell ya! My "mature" skin would love to try this. It is time to start using a high quality product. This is definitely high quality. Good luck, Anne-Marie! My skin is very similar to yours except at this time of year, living in Winnipeg where winters are long, cold & DRY, makes my skin super dry mostly on my face! Its NOT pretty! The winters are so hard on our skin. I'm mostly dry on my body since I take much better care of my face. Need to step up my body care also. Good luck, Leslie! Thanks for entering, Caryn. Good luck! I like trying natural products. I hear you! Good luck, Maria!! I would like to try it out as I'm looking to add more natural products to my skin routine. Thanks for entering, Lushka! Good luck!! Thanks for entering, Tina! Good luck! !